The history of asphalt pavement is one of innovation. Practically from the day that the first asphalt road was built, manufacturers and engineers have sought ways to improve the material. 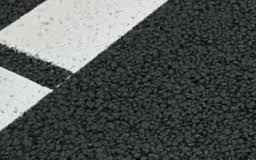 As a result, there are now several different varieties of asphalt pavement. The most commonly used asphalt in the United States is HMA. This is the traditional asphalt pavement, sometimes called blacktop or bitumen, that is an economical, durable and attractive all-purpose material. HMA typically contains a certain percentage of reclaimed asphalt pavement although “virgin” pavement is also available. Fine-graded and coarse-graded asphalt are HMAs that have been assigned a grade according to the size of the particles, such as the aggregates, that have been included in the mix. To qualify as fine-graded, the particles must be small, usually about the size of a sand grain. Coarse-graded mixes have larger particles, and for many applications, these are considered to be superior for pavements that require better protection against rutting. Porous or permeable asphalt does not seal out water and confine it to the top of the pavement. Instead, pores in the pavement allow water to penetrate. The water is then directed into nearby soil instead of into a storm sewer. Top of the pavement runoff is reduced or eliminated, and fewer or smaller puddles collect on the pavement. Porous asphalt is more fragile than HMA, however, so it is typically reserved for areas that support only light loads and/or low volumes of traffic, such as parking lots. Stone mastic asphalt has been popular in Europe for several decades, but it did not see use in America until the 1990s. SMA has a stone matrix that offers superior resistance to ruts and other deformations. Currently, most SMA is used on heavily traveled highways and interstates although some cities are using SMA at high-traffic intersections. Uncertain Which Type of Pavement You Need? Since 1983, Asphalt Pavement Solutions has been helping clients select the best pavement type for their particular needs. We offer an extensive range of asphalt maintenance services, including asphalt paving, repairs, driveway sealing and pavement markings. We have established an exceptional reputation among our customers in Pennsylvania, New Jersey, Delaware and Maryland for providing superior quality at affordable rates. For more information about asphalt paving or asphalt sealcoating or if you would like to request a free estimate, you can use our convenient online form or call us at 1-800-559-SEAL or 1-856-461-1710.